Groundcovers are low-growing plantings that are either not mown or not grasses, that is, they are alternatives to turfgrass. For example, English ivy, Hedera helix, might be mown occasionally, but because it is not a grass would by definition be a groundcover, not turfgrass. Or blue fescue, Festuca glauca, a grass, could be planted and not mown and it would be a groundcover, not turfgrass. There is no sharp definition of what is “low-growing” but certainly 20 cm height or shorter is “low-growing” and 60 cm of height pushes the upper limits of “low-growing.” There are those who consider that a groundcover may be up to 120 cm high and others who will not allow a “groundcover” to be more than 30 cm high. 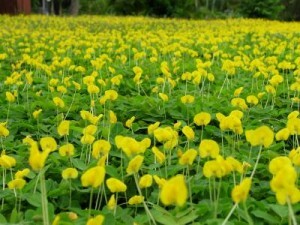 Despite the semantics, the intention of growing groundcovers is to have a planting that grows low enough for visibility but typically is not trafficked and does not require mowing. This is better operationally as a definition. Advocates for groundcovers as an alternative to turf mention that turfgrass has high maintenance requirements which groundcovers do not. There is meager data on this and in some cases groundcovers are badly invaded by weeds or have other maintenance problems. The best cases for groundcovers are in situations where shade is too dense for grasses, are that are inaccessible for mowing, and where there is a desire for color or other accents in the landscape. sandini – posted 19 August 2015 13:36 Does anyone know the name of ground cover that is about 6-8 in high, green, easy to maintain, and inexpensive to purchase?